Black Cat's Story: Update 9 - Kickstarter Campaign Launch! Update 9 - Kickstarter Campaign Launch! Black Cat's Story is now on Kickstarter! 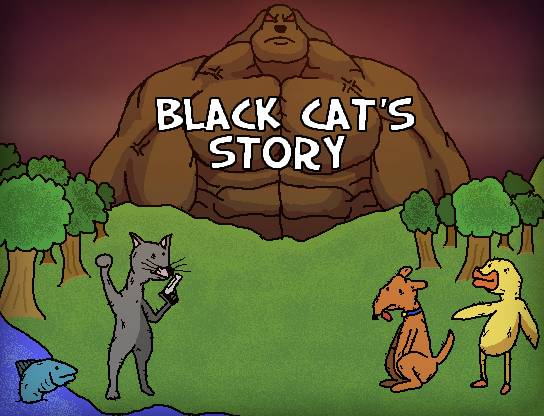 Black Cat must train and join up with his friends to defeat the tyrannical Ruffus, who is wreaking havoc on the land! Black Cat's Story is an off-kilter action adventure game which focuses on the story of Black Cat, whom takes upon the quest to avenge the fallen victims of a psychotic killer named Ruffus. Black Cat's story is a combination of both story telling, and turn based combat, borrowed from popular games such as Final Fantasy and Pokemon. Black Cat's Story is a humor-filled venture, featuring a diversity of off-the-wall characters, settings, and events. Throughout the game, Black Cat is able to join forces with his friends, acquire new weapons, armors and items, and uncover a marvel of secrets. I am an aspiring artist, musician, and composer. I'm currently developing some of my own original ideas, and hope to fund and produce some of them. I also want to help and give what I can to online communities and other enthusiastic developers and designers. Emberstorm Games. Awesome Inc. theme. Powered by Blogger.